Medications and physical therapy may not be enough to relieve your back pain. If nerve compression or another spinal disc disorder is diagnosed as the back pain cause, you may be a candidate for MISS (minimally-invasive spine surgery). Unlike traditional spinal surgeries, MISS involves a far smaller incision (or no incision), which can enable a variety of spinal surgeries to be performed in an outpatient setting. 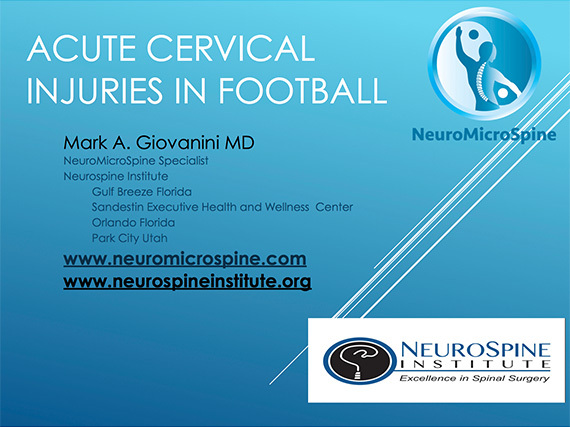 At NeuroMicroSpine, Dr. Mark Giovanini – plus other physicians at our Florida sites – are trained specialists in neurosurgery. The following are some Frequently Asked Questions (FAQs) and answers pertaining to outpatient center-performed MISS for people with back pain unresponsive to conservative treatments (e.g.,cortisone shots or physical therapy), so you can acquire a better understanding of the typical recovery period. 1. What is Minimally-Invasive Surgery? 2. After the Surgical Procedure, How Long is the Recovery Time Before Discharge? The usual time for post-surgery recovery before discharge home varies depending upon the type and invasive degree of the surgical procedure, as well as patient physiological response to the surgery. It is a good idea to expect at least an hour following surgery in a recovery area before discharge can occur. Reaction to anesthesia (whether general or local) differs between patients. The recovery time at the surgical center before discharge enables physicians and nurses to gauge whether a patient is likely to experience an adverse reaction to the anesthesia, and that the patient’s heart rate/rhythm, blood pressure, and breathing have returned to normal. It is important to recognize that – while recovery at home is normally much shorter for minimally-invasive surgery than traditional surgery – the actual recuperation time depends upon the specific procedure, patient’s other health conditions, and the patient’s overall health at time of the surgery. 3. What are Some Common Spinal Surgical Procedures Performed on Outpatient Basis? Lumbar decompression (which is one of the spinal minimally-invasive surgeries performed at Florida’s NeuroMicroSpine) is often recommended in people experiencing severe nerve pain due pressure of a lumbar disc against the sciatic nerve. This disc pressure is frequently the consequence of spinal canal stenosis. Cervical and lumbar laminectomies, vertebral disc replacement, and lumbar interbody fusion replacement are some other common minimally-invasive surgeries in the US that are also performed at NeuroMicroSpine. Indeed, an article in 2018 in Neurosurgical Focus reported equally-positive outcomes following cervical and lumbar laminectomy, cervical and lumbar fusion, cervical and lumbar discectomy, and cervical disc arthroplasty in outpatient surgical centers as compared to inpatient settings. Moreover, absence from the workplace following MISS was typically lower than following an open surgery. If you have a spine pain, we’d like to help you get relief. For more information on the best treatment for spine pain or to make an appointment with the doctors at NeuroMicroSpine please call (850) 934-7545 or click here to request an appointment. We hope to see you soon!